Dwarf fruit trees have what is called dwarfing rootstock. 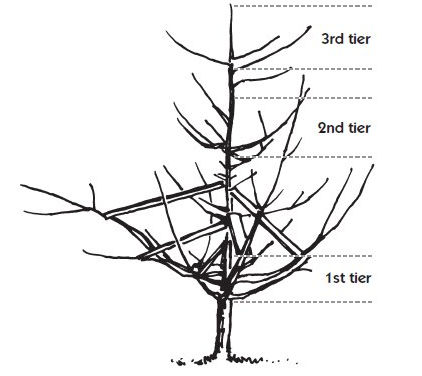 The top of the tree is grafted onto this rootstock, which prevents the shoot (above-ground portion) from growing very fast and becoming a large tree. There are different degrees of dwarfing depending on the type of rootstock, some types can be quite small while others will give a tree that can grow to 50% or so the size of a normal tree. Why do people grow dwarf fruit trees? 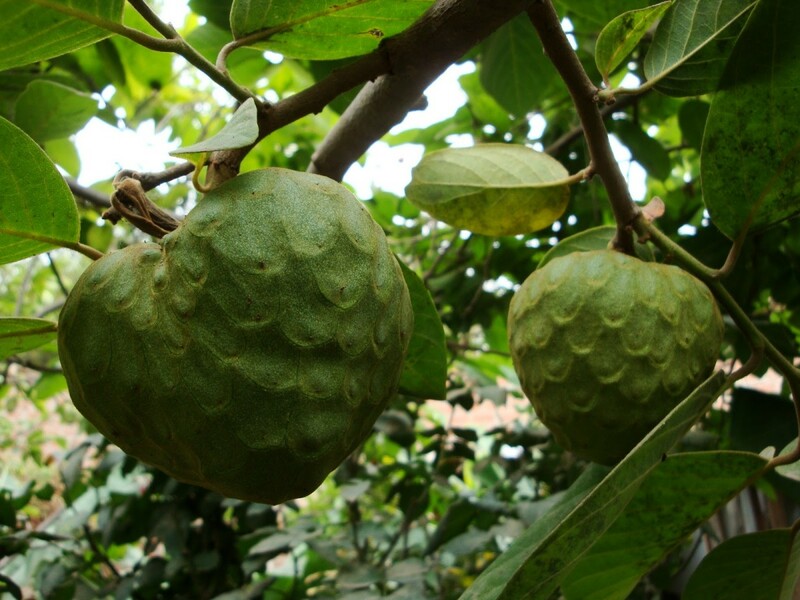 They produce fruit earlier than do other types of trees. You can expect fruit from a properly pruned tree in about 3 years after planting with a dwarf tree, whereas it may be 5-6 years with a normal tree. The fruit is much easier to pick since you don't need a ladder to reach it. Because they are smaller, pruning and spraying with pesticides is easier. They don't need as much space. With certain dwarf trees, you can plant them as close as eight feet apart. A wire tree trellis is used to help train the dwarf tree limbs to grow horizontally. Limb spreaders help open the dwarf tree canopy and train the limbs to grow outward. My experience is with apple trees when I lived and worked with the apple industry in Washington State for 15 years. The orchardists there grow the dwarf trees on trellises or stake them so they will have proper support when they are young. Since the root system is less vigorous, there is less support for the shoot portion of the tree, making some support necessary to prevent toppling during heavy winds, especially when the tree is laden with fruit. 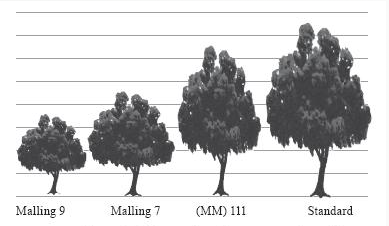 However, some dwarfing rootstocks do not dwarf very much and do not need this support for the tree trunk (like M111 for apples). To support the tree, either plant a stake for each or support it on a trellis if you have several trees. The stake can be a 2 x 2 pressure-treated board or pole and it should be about 8-10 feet tall. If you will have several trees in a row, you may want to put in a wire support system. Soils. Make sure that your planting site has good draining. Many trees will grow in almost any type of soil, provided it allows rain or irrigation water to flow through. 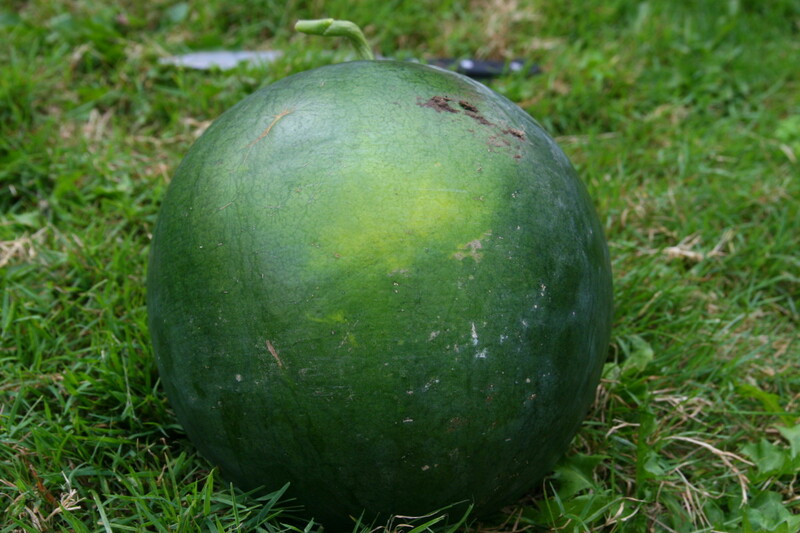 Soils with a high percentage of clay are not recommended for fruit tree growing. The roots don't get enough oxygen and there are different fungal root diseases that the trees are prone to contract under this condition. Avoid mulching around the trunk to prevent trunk damage by rodents. Horticultural supply stores also stock tree guards to help prevent rodent damage. Pruning and Limb Spreading. Another practice that is essential is pruning. Pruning during the dormant season helps make the tree take a proper shape so that sunlight can penetrate the canopy and it helps the tree to set a higher number of flower buds. Check out pruning manuals made by state extension agentices to find out the recommended ways to prune dwarf fruit trees so you can get the best production from them. And see the video below for further information about pruning. Limb spreading, or making the limbs more horizontal, is practiced to help broaden the tree canopy and help set fruit buds. 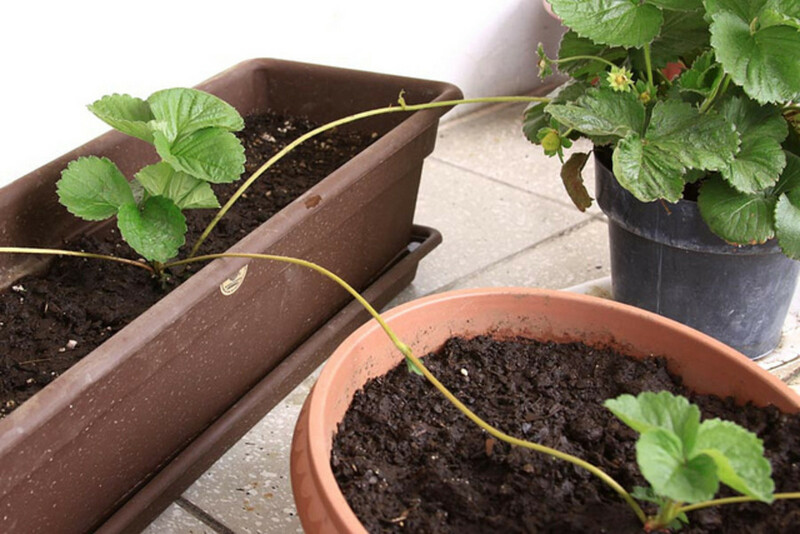 This can be done with wooden spreaders and/or wiring on a wired trellis. This is the key to getting fruit to set earlier in a tree. You can buy or make limb spreaders in horticultural supply stores. Having a Cross Pollinator. If you are growing a type of tree that needs cross-pollination, like apples for instance, you will have to buy and plant that cross-pollinating tree nearby. Commercial orchardists pair different varieties of apples, like Golden Delicious and Red Delicious together, or they will plant a mandarin crab apple tree every 4-5 trees. Fertilization. Fruit trees require a balanced fertilizer that has phosphorus for initiating growth and setting fruit tree buds. During the year of planting they should be fertilized with 10-10-10 three times, once at 2 weeks after planting. Then fertilize again at 6 and 10 weeks. Each time use 0.03 lbs of fertilizer per tree, or 15 grams. Dwarf citrus trees grow to about a maximum of 8 feet in height as compared to 20 feet with standard trees. They are grown in containers or outside in tropical and sub-tropical climates that don't experience freezing temperatures. These type of citrus trees are ideal for greenhouses in temperate climates. They produce fruit in 1-2 years. The soils should be well draining and they need to be fertilized with a granular or liquid fertilizer that has a 2-1-1 ration of NPK, nitrogen, potassium and phosphorus. Water on a regular schedule to encourage healthy growth, but don't over water. Pruning of dwarf citrus is not as involved as pruning apples. For container-grown trees, pinch off vertical or leggy growth occasionally to encourage more growth sidewise to make a fuller tree and produce more flowers and fruit. Clip off the limb immediately above a leaf. Pruning while the tree is dormant is not recommended. I grow dwarf orange and lemon trees in pots because I'm in a temperate climate. I move them under cover before the first frosts. I also grow a dwarf Pink Lady apple tree in a pot, in addition to the large apple trees in my orchard. I move the little Pink Lady close to my 100+ year old apple tree that came with the property. 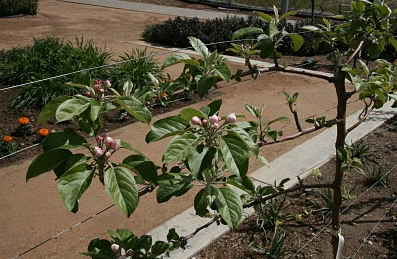 Having the tiny apple tree flowering near the big old one allows pollination. I don't want to put a new tree in the ground too close to the ancient one because the old one was neglected for many years and looked weak, almost dead, when we bought the place, and I don't want to spread any existing diseases. Having said that, I've picked more than 100 apples from it this season, so I think it is enjoying its new life now that it is no longer neglected. I encourage everyone to consider buying dwarf fruit trees. We get a nice harvest of citrus fruits in an area that ordinarily wouldn't support citrus. Voted up and useful.